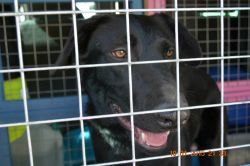 Charley is a four year old Labrador cross with special needs. 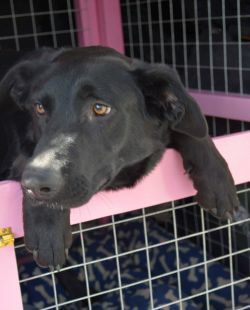 She was born in Spain and although PACT was not involved with bringing her into the country we could not ignore her plight when her new owners found she had medical issues and could not cope with her. Charley suffers from fits but epilepsy has been ruled out as the cause. She is now undergoing tests at The Queen’s Veterinary School Hospital Cambridge to determine the cause and her long term prognosis. Despite her problem Charley is still a bouncy, happy and lively young dog who loves and lives life to the full. Her condition does not bother her in the slightest and her fits sometimes present more like fainting spells when she gets over excited. Charley is a very happy dog who can be mischievous, jumps up, will chew and needs a patient owner who can train her in all aspects. As she is big, bouncy and a little uncoordinated we are looking for a home with adults/teenagers only as she could accidentally knock small children over. As with all our animals with on-going medical conditions PACT will continue to monitor and pay vet bills for any treatment required for her diagnosed condition. Currently her vet bill has exceeded £2000 and is still rising. If you would like to help us with some of the costs for her diagnosis and treatment please make a donation specifically for her on the back page.